Glucose is a type of sugar found in a range of foods, including fresh fruits and honey. Glucose is sometimes also called "blood sugar" as it is created when your body breaks down carbohydrates -- both sugars and starches. In turn, sugars in food include all varieties of sugars, such as fructose and lactose, not just glucose. Glucose is produced by your body as it breaks down carbohydrates, both simple -- such as table sugar -- and complex -- such as whole grains. It is used as a primary source of fuel for your body and is either used as energy immediately or stored in your liver and muscles for the future. Glucose is a simple sugar found in some foods, including corn syrup, honey, blueberries, raisins and peaches. However, it is also commonly found in the human body as the result of the digestion of carbs. Because glucose is absorbed directly by your body, it rapidly increases your blood sugar levels, giving it a high glycemic index, 100, when compared to other foods. The glycemic index measures how quickly a food affects your blood sugar levels. Sugars found in foods are divided into either natural sugars or added sugars, both of which are considered a simple carbohydrate. All sugars will break down into glucose. Natural sugars, such as fructose and lactose give some foods, such as fruits, their sweet taste. Added sugars are put into processed foods and drinks to augment the taste of food. They are commonly found in baked goods, candy and soft drinks. Some natural and added sugars, such as sucrose, maltose and lactose, naturally contain glucose as they are disaccharides. Disaccharides are two simple -- single -- sugar units attached together chemically. Carbohydrates are sometimes divided into good and bad carbs. Bad carbohydrates refer to refined carbs, such as table sugar or white flour. Good carbs are those that have more dietary fiber and are part of the complex carbohydrate group, meaning starchy foods, such as legumes, potatoes, vegetables and whole grains. Complex carbohydrates are made of chains of glucose. Even though fruits are high in simple carbohydrates -- natural sugars -- they are also rich in dietary fiber, which puts them in the complex carbohydrate category. Complex carbohydrates are better for your health because they take longer to break down, leading to more stable blood sugar levels and a steadier source of fuel for your body. Of all the sugar and starch choices you have, simple carbohydrates in the form of added sugar is the least healthy option. 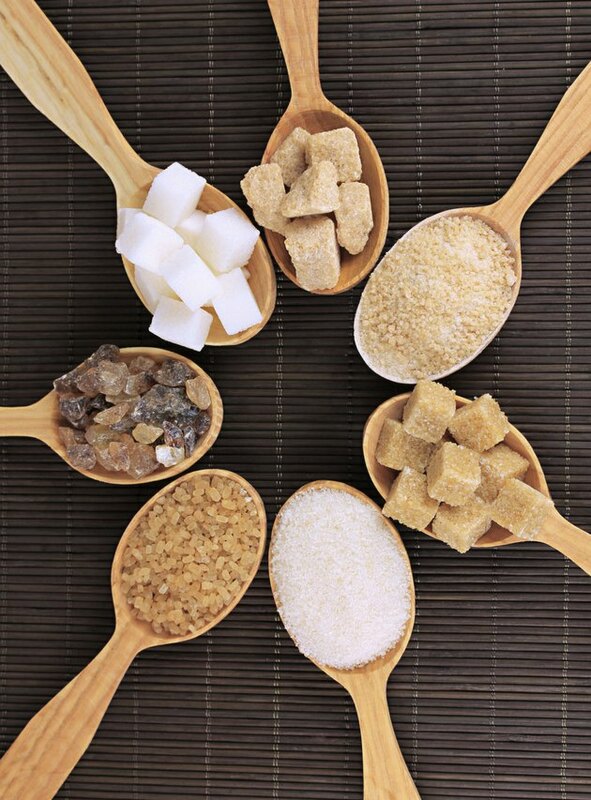 Added sugars include refined sugars, such as table sugar, but also natural sweeteners such as honey or maple syrup. These sugars, despite being less processed, are still simple carbohydrates that contain little additional nutritive value, such as essential vitamins and minerals. A diet high in added sugar is common in the U.S. and, according to the American Heart Association, it can increase your chances of weight gain and obesity. The AHA recommends eating no more than 6 to 9 teaspoons of added sugar per day.